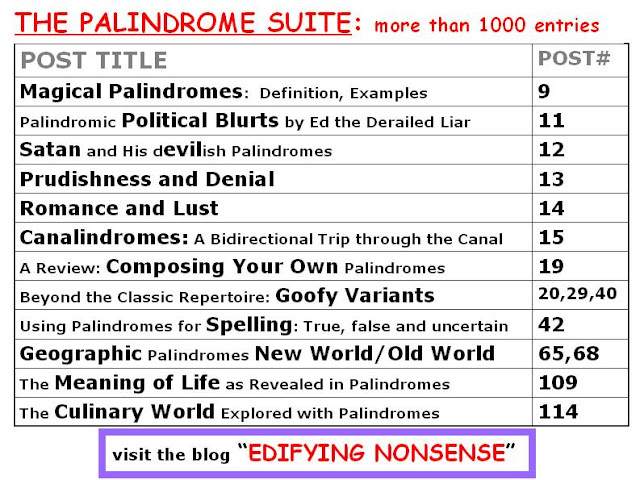 ASSESSMENT OF PALINDROMES, specifically those seeming to relate to spelling. Based on the classic palindrome, "No X in Nixon. ", such reversible adages seemed worthy of review as to their veracity. AUTHOR: Giorgio Coniglio, March 2017. Palindromic phrases and sentences are distinguished by green font. No 'D'; no 'L' - Boston; not (sob!) London. An 'A', 'B', a 'C', 'A' - cabana. No 'L' lags - gallon. 'X 'n 'Y', Lara - lynx. No 'K' in Nixon; No 'X' in Nikon. 'X'; 'Y'; no 'Z' - onyx. A dog, a person: no 'S' re pagoda. A man, a person: no 'S' re Panama. No 'L' - a Saxon; no 'X' - a salon. No 'LEMON' in "O, melon". No 'X': - an axon. No 'X', Al - klaxon. No 'D'; no 'L' - London. "No 'I', told Ed - "Lotion." Not 'L' - I'm Milton. No 'L' - a salon. No 'M', lass. Tin is sin. It's salmon. No 'X' - a Saxon. No 'T'; no 'W' - wonton. No 'T'. Naw! - wanton. An 'A', 'n' 'A', 'B' - banana. 'B'; mock 'K' - comb. 'B'; 'M' along - no lamb. A 'C', a 'R', am I maraca? A man, appetite 'P' - Panama. No 'E' - Exxon; no 'XXE' - eon. Not 'UF' - not on futon. 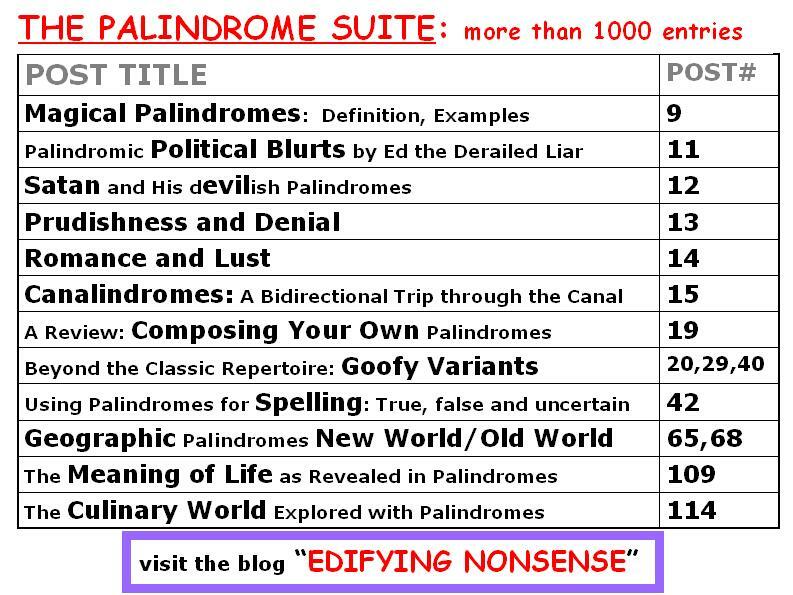 Based on the above analysis, palindromes appear to be an inappropriate linguistic mode for confirmation of orthographic truth. In fact, palindromes seem surprisingly misleading in this regard.